Solid Copper Conical Path & Area Light Available With LED Bulbs For Flexibility In Design. 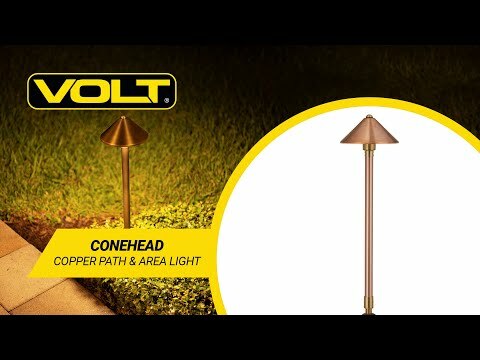 The Conehead is a pro-grade copper outdoor landscape light from VOLT®. Featuring a conical-shaped hat on a 24" stem, the fixture complements all landscape and architectural types. Utilizes high-quality internal components to ensure a long lasting fixture. With premium components inside and out, this superior quality fixture will add lasting beauty to your landscape. Lifetime warranty. Solid copper construction for durability and beauty. There is no powder coating, paint or finish to wear off or peel—just the natural beauty of copper that continues to patina as it ages. Solid brass, copper or stainless steel components. 4' UL certified 16AWG, SPT-2 premium tinned copper lead wire. Add color matching 6", 12", or 24" extension (or telescopic) risers to raise overall height and increase the illumination diameter. Beam Spread & Suggested Spacing. Approximately 12' diameter beam spread. For continuous illumination along path, space about 12' apart. For independent pools of light, space about 20 ft. apart.